Postcard From Bosnia by Floyd S. Werner Jr. Things here are going okay - that is to say I havent been shot at yet and I have been able to model (got to have priorities). The weather has been terrible. It rains at least once a day. Sometimes it is just a sprinkle other times it is torrential. Im not flying missions, but Im doing all the test flights. This is new to me, as I am use to being there in the mix. Oh well, get promoted and have to leave the flying to the younger crowd. 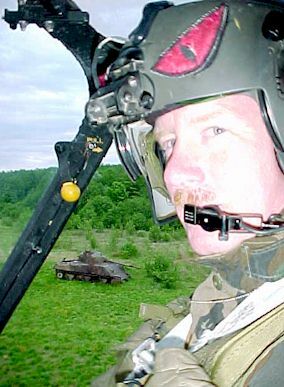 An unknown pilot in the Comanche Helicopter Training Area (HTA) with a blown up Sherman in the background. Conditions here are really nice compared to last time. We have showers and a great dining facility (mess hall, DFAC). I eat better here than at home. We are living in buildings with between 3-6 per room. Depends on rank, I live with two other warrants. Work hours are between 12-14 hours a day. I try to give the guys Sundays off if I can. That means my model building is limited to about 1-2 hours each night. Im currently working on an X-wing (the small older release, article to follow its completion). It has telescopic tubing for the cannons. Very nice touch. Article to follow. 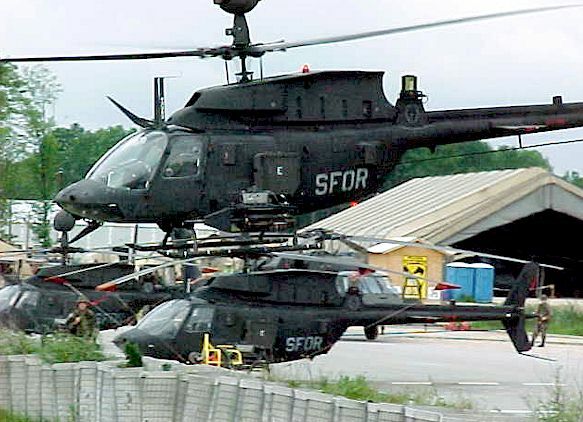 The OH-58Ds are holding up exceptionally well. I would like to take credit for it but it is the enlisted that keep these things flying so well. 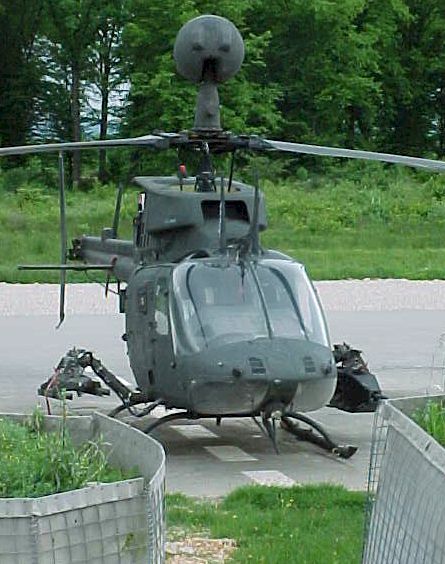 Everyone in the Army is following our progress very closely, as this could mean the difference in the Kiowa Warrior program. I still havent received anything from the States as far as models go, but Ive had lots of emails that have said there are things on the way. Ive talked with the Morale, Welfare, and Recreation (MWR) people and they were enthusiastic about my "Modeling 101" class. Once I get the supplies I will hold a class on Sundays for those interested. For those not I will still let them have a kit if they want it to build. That is about all for now. I would like to thank everyone for the emails, support and the newsletters. It isnt so bad being gone when you have family and friends such as you to come home to. Images Copyright © 1999 by Floyd S. Werner Jr.